Welcome back to our continuing journey of perfect pairings for our SCHMETZ needles, Sulky and Gütermann threads. Yesterday I listed the materials required to make a thread painted and quilted panel. Today I’ll do some preparation work, a little bit of piecing and add borders to our beautiful Artisan Spirit Water Garden panel from Northcott. You’ll see how the correct needle and thread make each step along the way both fun and easy. Good preparation is the key to success! I start by trimming a little bit off our panel. I want the measurement of the panel to be easily divisible by 5 as I want to add a pieced border that consists of 5″ finished squares. To make the math easy I decided to add a narrow, un-pieced inner border to bring the center section to the correct size. 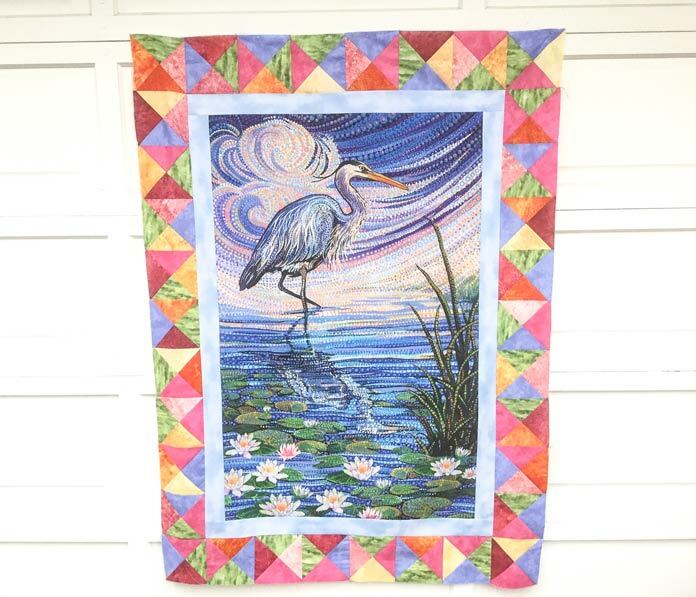 To allow for a 2½” narrow border I need to straighten the panel and trim it to 26½” x 41½”. Next, I trim each piece of Sulky Soft’n Sheer Extra stabilizer to measure 26½” x 20″. Press in place one at a time to cover the wrong side of the trimmed panel. You’ll be a little bit short in the length but that’s OK. 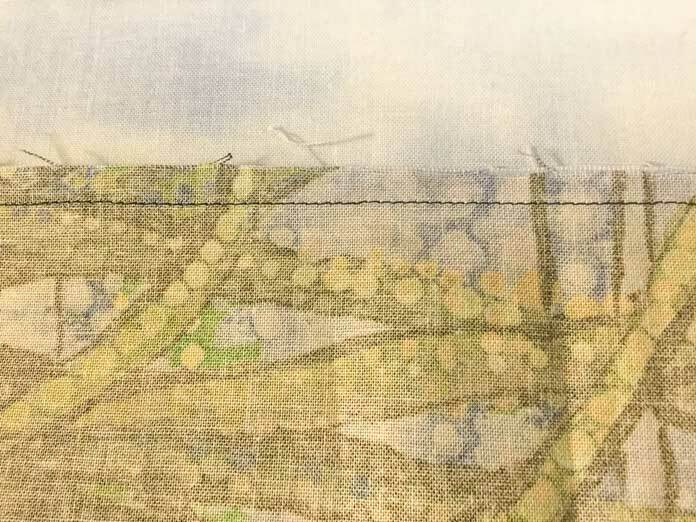 The Soft’n Sheer will add just the right amount of extra body to the panel fabric to prevent it from stretching when it’s time to add the thread painting. It’s time to set up the sewing machine. Attach a ¼ foot and insert a new SCHMETZ 75/11 Quilting needle. The tapered point on this needle penetrates fabric easily for quality stitching and easy matching of points. Remember, for optimum success your needle should be changed every 6 to 8 hours. A good way to remember is new project, new needle. Thread the machine with Gütermann 50 weight cotton thread. This 100% natural cotton thread is made with the finest, long-staple cotton. The stability of this thread makes it easy to achieve accurate piecing. 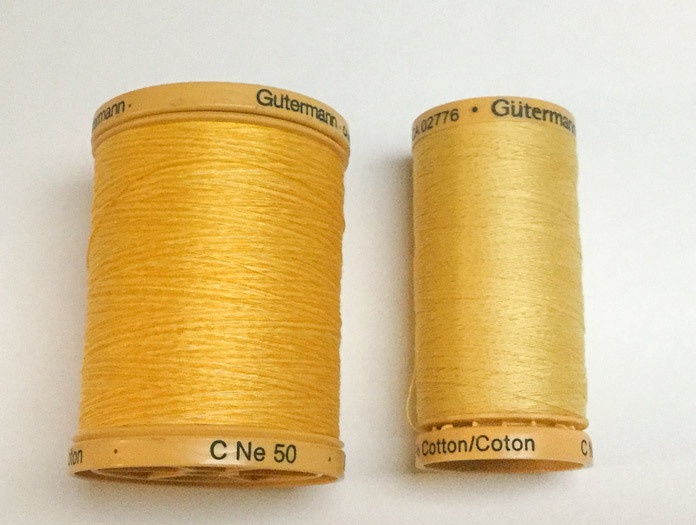 Gütermann 50 weight cotton thread is available in a wide range of colors to match your chosen fabric. 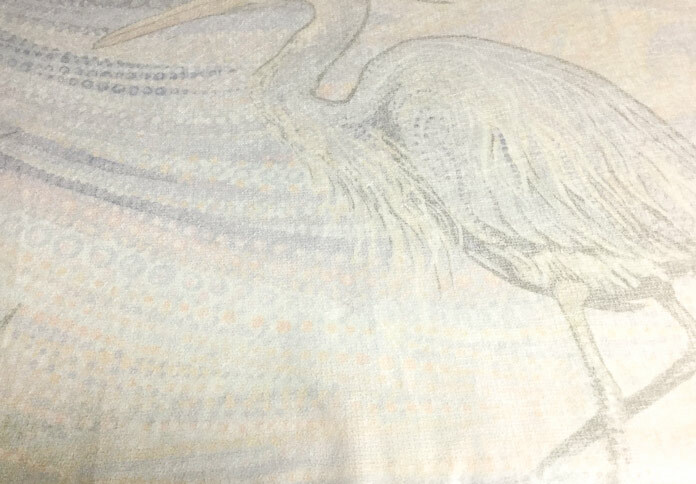 All seams are sewn using a scant ¼”. This is just a tiny bit smaller than a measured ¼”. All strips are cut from the width of fabric. Choose one of 6 fabrics to use for the narrow inner border. I used the light blue sky print from the Northcott Naturescapes. Cut 2 strips 2½” x 41½”. Pin in place then sew to the long sides of your panel. Press the seams towards the border strip. Cut 2 border strips 2½” x 30½”. Pin in place then sew to the top and bottom edges of the panel. Once again press the seams towards the border strip. 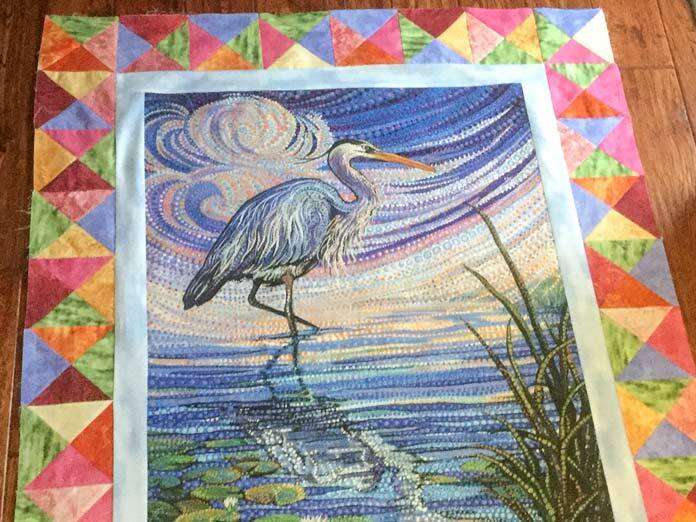 The piece now measures 30½” x 45½” so it will be easy to add a border of 5″ (finished) squares. 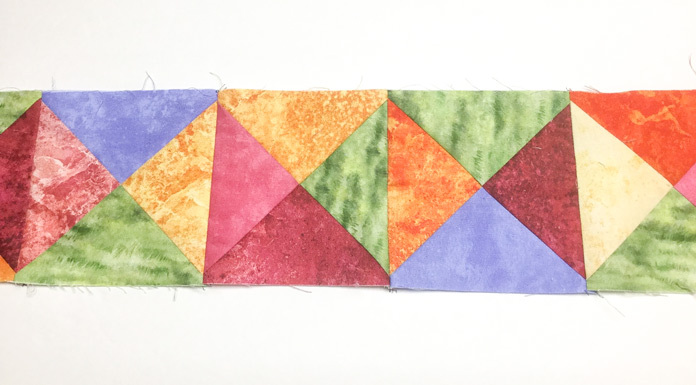 Cut a 6¼” strip from each of the 5 remaining fabrics for the pieced border. Cut each strip into 6¼” squares – you need 34 squares.If the fabric is less than 44″ wide you’ll need to cut 5 additional squares from the remaining fabric. 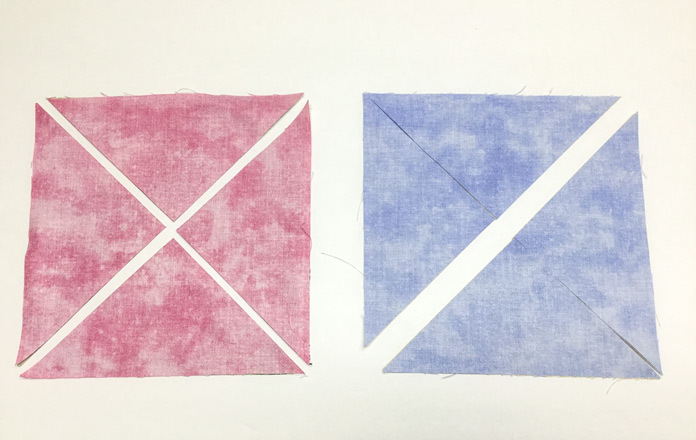 Place the squares right sides together together in pairs of two different fabrics.Try not to plan the color combinations as random is better for this border. You’ll have 17 pairs. Cut each pair of squares in half twice on the diagonal. You’ll have 68 pairs of quarter square triangles. 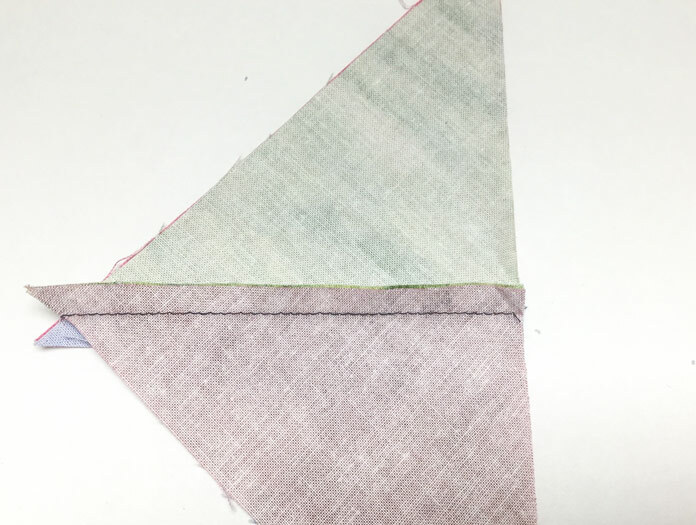 Sew quarter square triangles together in pairs by sewing a ¼ seam on one short side. 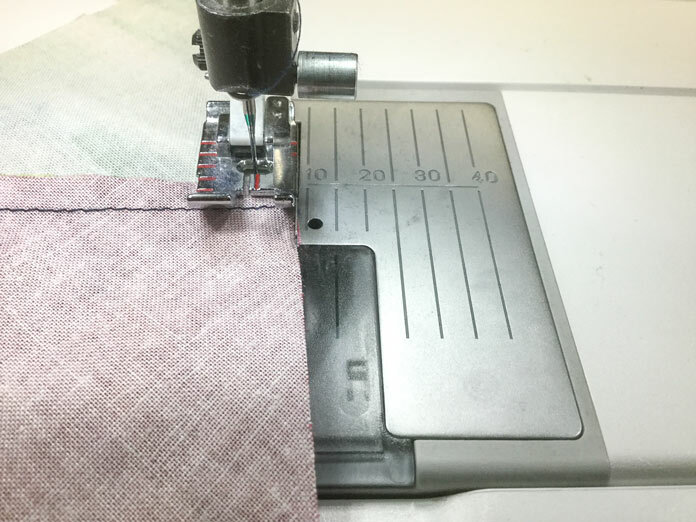 Press all seam allowances in the same direction so that the top seam will be facing towards the back of the machine as you stitch. Place triangle sets together in pairs of random colors. Snuggle the seam allowances together. Pieced triangle pairs ready to sew the second seam. Sew together on the long side. You won’t need to pin the pieces to sew as the machine will magically want to push the seam allowances together when they are pressed this way. Match the seam allowances as you sew. Trim off the extra little points on the squares. Randomly sew the squares into two sets of nine squares for the side borders and two sets of eight squares for the top and bottom. Pin the corners of the squares so that they match nicely. Press the seams on the side borders all in one direction. Press the seams on the two end squares of the top and bottom borders towards the outside edge. All other seams can be pressed in one direction. Pin and stitch the side borders in place. Press towards the narrow, un-pieced border. Pin and stitch the top and bottom borders in place. Be sure to pin and match the seams where the outside squares meet to join the top and bottom borders. Your panel has all of its borders and is ready for quilting. Our 50 weight cotton Gütermann thread did a beautiful job of piecing. 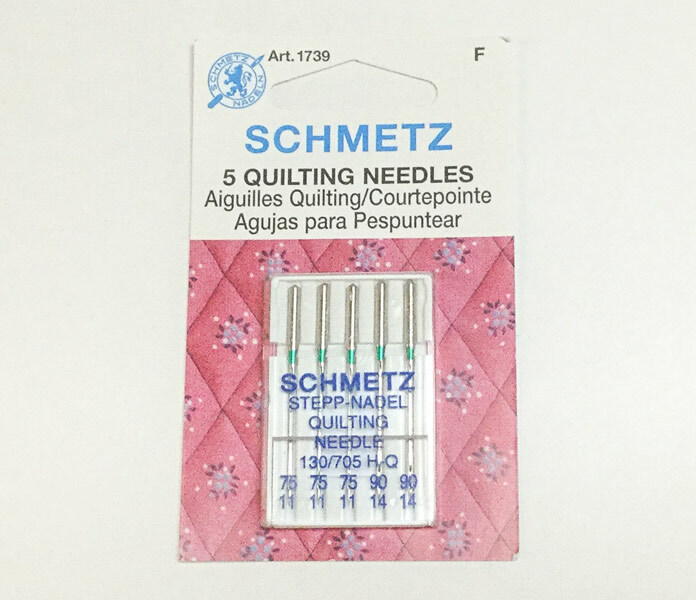 Did you notice how easily SCHMETZ quilting needle handled all of those seam allowances? Come back tomorrow, we’ll use our SCHMETZ needles and Sulky thread to add a further dimension to the piece with some easy machine trapunto. Thanks for the tutorial, this panel is amazing! I’m glad that you enjoyed the tutorial. This is just one of the amazing panels available from Northcott. I hope you’ll choose one and give the project a try. Thanks for the kind words Elizabeth. I’m glad that you enjoyed the posts and hope this information will continue to help you in the future.